It’s so humble, so natural, so friendly; it’s the bread and wine of the poor who ask no more than that they should be left in peace, allowed to work and eat their simple food in freedom. It’s the cry of the despised and rejected. It tells you that whatever their sins men at heart are good. 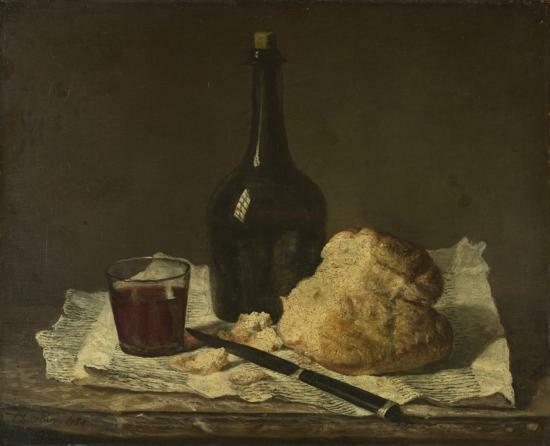 That loaf of bread and that flagon of wine are symbols of the joys and sorrows of the meek and lowly. They ask for your mercy and your affection; they tell you that they’re of the same flesh and blood as you. They tell you that life is short and hard and the grave is cold and lonely. It’s not only a loaf of bread and a flagon of wine; it’s the mystery of man’s lot on earth, his craving for a little friendship and a little love and the humility of his resignation when he sees that even they must be denied him. See Laudator Temporis Acti for more on this painting.